Pop quiz: If you compare Oregon’s economic growth from 2001 to 2010 to that of the nine states in the country that levy no personal income tax, how well did the Beaver State perform? Answer: Oregon topped them all. 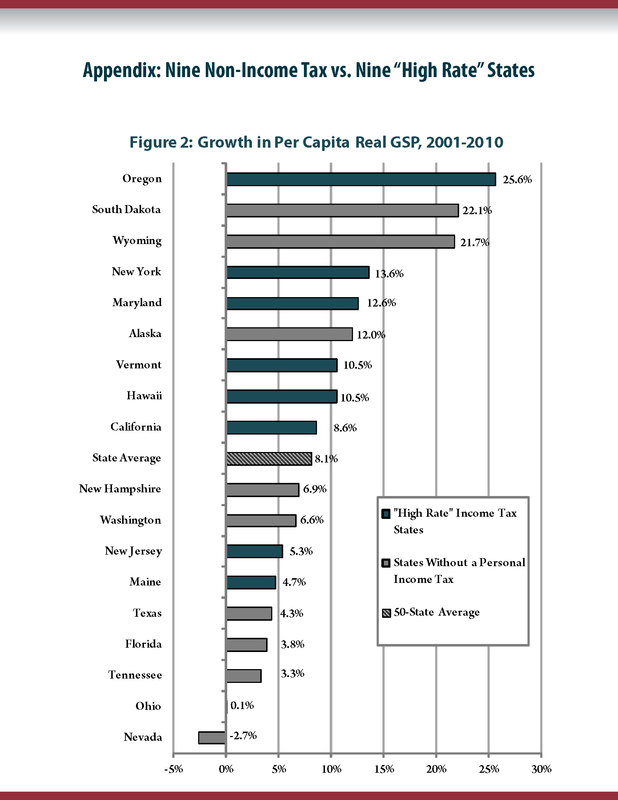 The answer comes by way of the Institute on Taxation and Economic Policy’s (ITEP) new report “High Rate” Income Tax States Are Outperforming No-Tax States: Don’t Be Fooled by Junk Economics (PDF). Their analysis examines real per capita Gross State Product, meaning that it takes into account inflation and population growth. The answer might not have come as a surprise to those who read OCPP’s December publication If Economic Growth Assured Well-Being, Oregonians Would be Thriving. In it we pointed out, among other things, that Oregon had the second highest growth in real per capita Gross State Product from 2001 to 2010 among all 50 states and the District of Columbia. residents of “high rate” income tax states are actually experiencing economic conditions at least as good, if not better, than those living in states lacking a personal income tax. What does this mean for Oregon? It means that lawmakers should reject bad ideas, such as the (bipartisan) proposal to create a work penalty by giving preferential treatment to unearned income from capital gains (PDF). And they should extend the temporary top tax brackets voters approved in Measure 66 while cutting back tax expenditures that disproportionately favor the wealthy (PDF). States with high income taxes have as good or better economic performance as states without income taxes. It’s time for our elected leaders to act on the facts. Very interesting Chuck. To what extent do you attribute the association directly to tax policy? Is it possible that the tax policy is a proxy for other kinds of approaches to social investment? An anecdote: In my youth I belonged to the Clamshell Alliance, a mostly Massachusetts-New Hampshire movement opposed to the Seabrook nuclear power plant in southern New Hampshire (counterpart to Oregon/Washington Trojan Decommissioning Alliance). In 1977 there was a large demonstration in which thousands of people briefly occupied the plant grounds, and 1414 were arrested. Most of the arrestees adopted a position of refusing to give names and cooperate with the arrests, forcing the state to hold them or release them. New Hampshire put them in an armory because they lacked the jail capacity, and eventually released them after about 2 weeks because the state budget was on a such a shoestring that holding them was driving the state broke, having no income tax and I think no sales tax and pretty minimal property taxes, subsisting largely on state liquor store sales to bulk buyers from the Boston area. That was in the days of the dominance of the Manchester Union Leader, when New Hampshire was the Mississippi of New England. Live Free or Die! What is important to note, however, is that it also doesn't suggest that there's an inverse causal connection -- which is precisely what the Republicans would have us believe. No, having high income taxes doesn't hurt your state economy. Chuck, the overwhelming message I get from the ITEP report is that Oregon's growth since 2001 is going almost entirely to the upper income bracket. Our unemployment rate is the highest of all the states studied, and median income is in the middle. So where is all that money going? Steve, OCPP showed graphically in mid-December that the top has harvested the gains as income inequality has worsened. I would be interested to learn your definition of "stronger state economies." I assume the title of your post is meant to imply that a High Income Tax leads to a strong economy. In my view that is a stretch to the breaking point. To be certain, high income taxes do have an effect on some income earners but to say it has a positive effect on the economy requires some very selective data. Why did you not show the data points for the same states relative to unemployment, where Alaska, Wyoming, and South Dakota all have performed significantly better than Oregon. Or maybe you could have chosen the poverty rate. Last November your organization painted a very bleak picture of poverty in Oregon (http://www.ocpp.org/2011/11/09/fs20111109graphic-view-poverty-oregon/) Was that accompanying a high income tax rate? Your employer OCPP seems to produce information not "because facts matter" but more likely because "the right facts matter" to those OCPP wishes to influence. As noted in my comments above, we do not claim nor mean to imply that there's a causal connection between states' economies and their tax systems. We just note that Oregon is a high tax state and Oregon's economy performs well. How do we measure economic performance? As noted in this OCPP paper we measure it by Gross State Product growth and productivity growth. The ITEP paper looks at three measures of economic performance and shows that states with high income taxes perform as well, or better, than states without income taxes. The poverty rate reflects in part how well economic gains are shared, not necessarily whether one economy is growing better than another economy. Oregon's unemployment rate has been below the national average only 5 out of the last 38 years -- how we are relative to the national average is not necessarily a good measure of whether the economy is growing. To understand the role that income taxes play or don't play in state economies, see the Alm and Rogers study cited here. Thanks for the link to the Alm and Rogers Study. I read it but am not sure I understood it fully. It has more disclaimers about the meaning of the data and the potential errors in the methodology than any paper I have ever read. My reading of it is that they conclude nothing of which they are sure except that states with Republican governors grow slower than states that do not. To me the only conclusions they make in which they profess any confidence are that taxation policies have widely variable results and spending policies have consistent results. The AFL/CIO draws conclusions (not drawn by the authors) even more suggestive than yours: http://www.seiu.org/2011/07/us-states-that-slash-spending-report-highest-job-losses.php I would be curious to know how the numbers would look if they had followed the trail of older states vs newer states and larger states versus smaller ones. It seems they took these data out of their study because they may have confused things even further - maybe even contradicted the few conclusions they made. In any event, it was interesting to see this in more depth. From my perspective, the authors' disclaimers show that this headline, at least, is a real stretch.